Starting at the turn of the 19th century, scientists inspired by Benjamin Franklin’s study of electricity started to look at ways that electricity could be generated and its energy turned into light. The idea that a lamp could be created that used electricity for use in coal mines. Oil and gas lamps were credited with causing a rash of explosions in Europe and alternatives were needed. It started with Sir Humphry Davy, a British chemist who is credited with the discovery of alkali metals whose properties could generate electricity. Davy experimented with different filaments and containers to make a lamp that could be used in the mines. Davy Lamp was not successful, but began a century of experimenting with electricity. Building on a half-century of research, Thomas Edison experimented with different filaments, eventually settling on a carbon filament. Edison held the first successful test on October 22, 1879. It lasted 40 hours. Later, Edison and his team would discover materials that would last over 1,200 hours. Even though Edison did not invent the lightbulb, his significant improvements to the design of the lightbulb raised public consciousness on the wonder of the electric light branding him as the inventor of the lightbulb. It was one of over 1,300 inventions during a remarkable career. 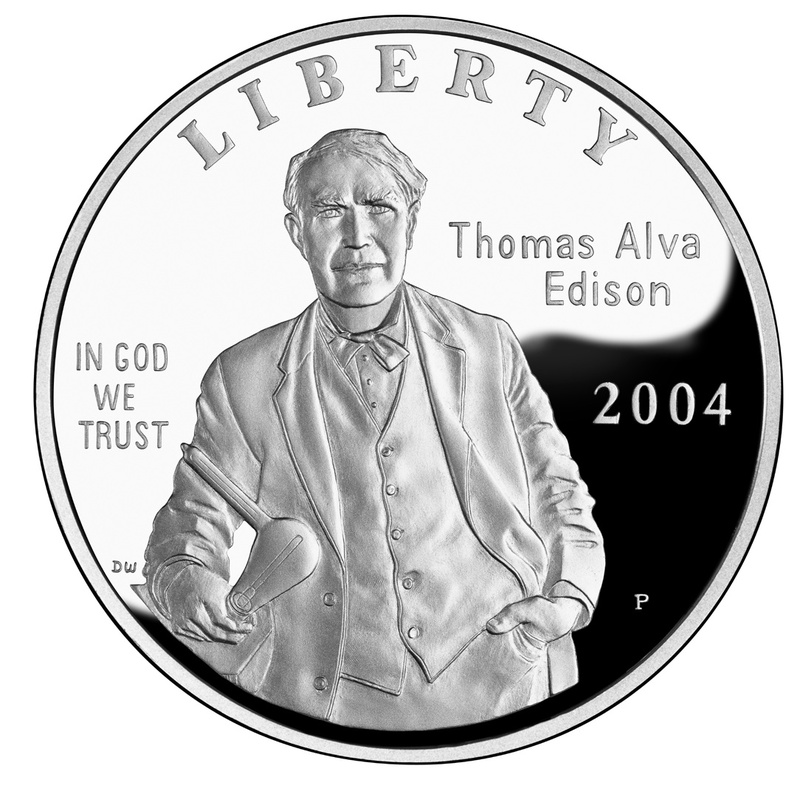 The design of the 2004 Thomas Alva Edison Commemorative Coin depicts a portrait of Thomas Edison holding an early experimental lightbulb. It was designed by U.S. Mint Engraver Donna Weaver. 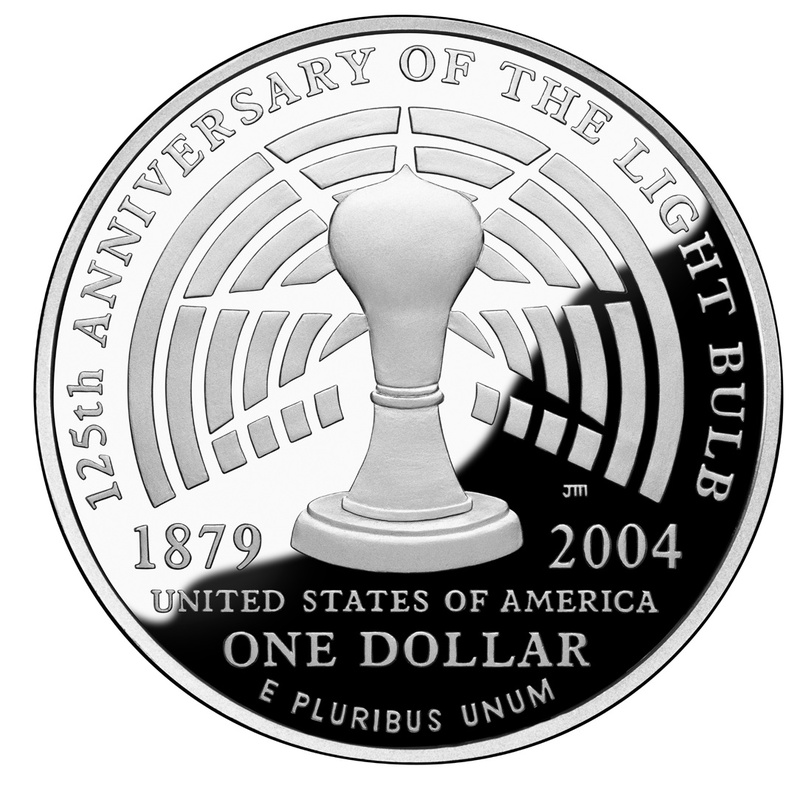 The reverse depicts Edison’s first lightbulb and designed by John Mercanti. These commemoratives were struck at the Philadelphia Mint and was sold out.